One is a 358-page tome that, when printed out, weighs more than three pounds. Another is a breezy 11 pages with colorful charts and graphics. There’s a report by a Michigan business group. A state advocacy organization. A think tank. And by the governor’s office. Economists have weighed in, as have academics, politicians and corporate leaders. There have been so many reports written about how to fix Michigan schools, the department of education now has a committee assigned to write a report about the reports. No word yet about how many pounds that will weigh. As Michigan voters prepare to elect a new governor and members of the House and Senate, candidates will have no shortage of guidance on how to reverse the state’s staggering decline in the classroom. But politicians are busy people. So Bridge reviewed 12 reports on school reform in Michigan, all but one published in the past four years. Total pages: 808. That’s slightly shorter than “War and Peace,” but with a more depressing theme. Total weight: eight pounds, 1 ounce. That’s the weight of a human head, if Jerry Maguire is to be believed. While we’re sure we missed a few, these reports – written by a variety of experts and practitioners – share some remarkably similar recommendations. Why so many reports? Perhaps to match the volume and gravity of crises that afflict the state’s public schools. “The urgency could not be greater. While it is difficult to face, the data are clear: Michigan’s public education system is dramatically failing our children,” stated the 21st Century Education Commission, a 25-member group of educators, advocates and business leaders primarily appointed by Gov. Rick Snyder last year. 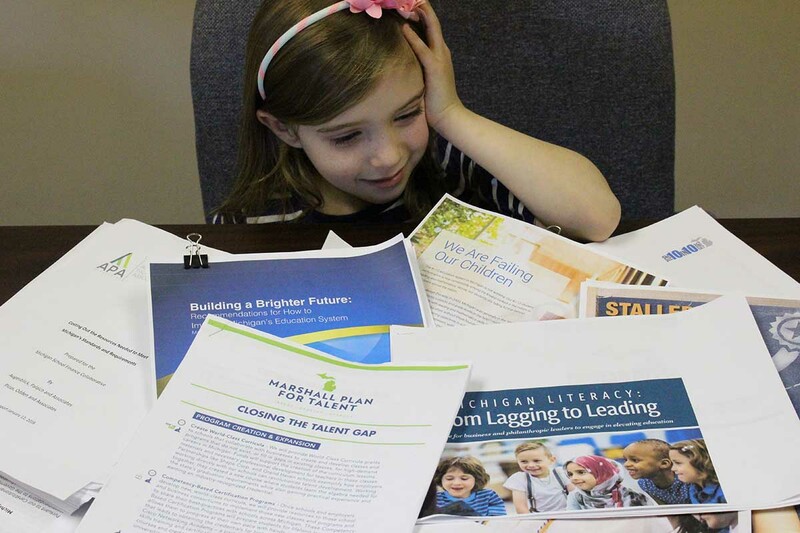 Michigan is one of only five states in which reading skills declined between 2003 and 2015, according to “Top Ten in Education: Not By Chance,” published in February by Education Trust-Midwest, a Michigan-based school reform advocacy group. Other reports focus on how poorly educated students bring down the rest of Michigan. A June 2017 report by Michigan Future, for instance, noted 74 percent of Michigan residents have stagnant or declining income. A 2015 Upjohn Institute report found that our state’s educational shortcomings cost the average Michigan resident $18,000 over a lifetime; that’s about $27 billion for the state as a whole. Michigan not only lost out on Amazon because of the lack of an educated workforce, it also can’t supply the needs of current Michigan businesses, says another report, released just this week by Business Leaders for Michigan. Of the dozen reports, one, sounding an early alarm about early literacy, was published in 2002. The other 11 were published in the past four years. Some focused on early literacy, some on college access or career training, others on K-12 policy. But there was a surprising consistency in what they recommended. It costs more to educate low-income students, because they generally enter kindergarten already behind in reading skills. To get them caught up with their peers takes more personal attention or smaller classrooms. The same goes for English language-learners. That’s the assessment of reports ranging from the Upjohn Institute, a think tank based in Kalamazoo, to Public Sector Consultants, a Lansing-based research firm, to the Michigan Department of Education. One way to improve student learning is to pay attention to the people teaching them. Michigan spends less on teacher training than some other high-achieving states. For more information check out reports by Business Leaders for Michigan, the Michigan School Finance Research Collaborative and MDE. Kids come to kindergarten with huge differences in academic preparation, and that gap is frustratingly hard to close. Part of the answer is to put more effort into preparing kids before they get to kindergarten, from birth through age 4. While the title guarantees it will never go viral, “Costing Out the Resources Needed to Meet Michigan’s Standards and Requirements”, a report recently released by a collaboration of business, community and school leaders, does a great job attaching dollars to needs. The report estimates the price of a good education for 3- and 4-year-olds at more than $14,000 per year. More attention to early childhood learning is also pushed in reports by Public Sector Consultants and Education Trust-Midwest. MDE’s “Top 10 in 10 years” report sets a goal of publicly-funded preschool for all 4-year-olds by 2020, and for 3-year-olds by 2025. Michigan is below the national average in the percent of adults with college degrees. Those with college degrees make, on average, $900,000 more over their lifetimes than those with just a high school diploma. The state also has a shortage of adults who have the training and/or certifications needed for jobs that require more than a high school diploma but less than a bachelor’s degree. Gov. Rick Snyder’s Marshall Plan for Talent, unveiled recently, pushes for investment in schools for career tech. Getting more high school grads into college is recommended by Michigan Future. But for all the reports and recommendations, those leaders invested in fixing our schools complain that no dramatic change has taken place. After more than a dozen reports, former state Board of Education President John Austin said it’s time for action. “The big fix won't happen unless and until a governor election and cascading legislative victories turn on a more or less specific plan that will overhaul our school finance system,” Austin told Bridge in an email. “Absent elections … or meaningful business-led offensive to shape politicians behavior, we won't see fix. "Does the report address the skills needed by the work force?" Education should be a balance between what education wants to teach and what the economy wants to survive and expand in an internationally competitive marketplace. Does a graduate know how to work, and does he have the knowledge and skills to be successful when he enters a workplace filled with experienced workers? He or she does have to compete for work with these people. Does the report address the key issue of "How to study?" If a student does not know how to study well enough to fully satisfy the requirements for first grade, how will he or she do in each grade there after? If a girl does not know how to read at third grade level? This is considered vital, but how do you fix it? Well, there is a law now that says, if she is one grade behind, she will be held back in 2020. Where are the study skills she needs at each grade level, to learn that grade level? Does holding a person back in third grade, repeating third grade, make sense, if they can not be successful in second grade? Each student should know how to succeed at each grade level, and demonstrate mastery of that grade level, before moving on. This should be required of the student, and the teacher, before the child gets into trouble. Can we teach teachers to do this? If not, why? Can we require it? If not, why? We should be smart enough to know these things and ask "Why" if these reports do not address them and handle them. I think it is possible to detect when a person has become unable to learn. This is possibly the key factor here. If a child can NOT master first grade in one subject, has he become unable to learn that subject? (from there on out) Some tutors have this skill. Some teachers have this skill. They can detect when someone has become unable to learn. That is the time to correct it, not one hour later, not in the third grade, not by doing a remedial course before one starts college. This is a most vital skill. Does each report address it? We don't need to spend all this effort on fixing schools if we can fix the parents and families first. They will fix the schools when they have parents , TWO, that are involved and care! John H, what do you recommend for a family that loses a mother or father due to an illness or accident? What do you recommend for the children that have parents that just don't care? One thing we clearly DON'T need is more 'reform' from Betsy DeVos & her lackeys in Lansing! The current situation is largely the product of their pro-privatization and anti-government religion. (I say 'religion' because it is a philosophy based solely on faith, not empirical reality.) After over three decades of this 'reform', we have enough evidence that it has failed. And I quote, "Part of the answer is to put more effort into preparing kids before they get to kindergarten, from birth through age 4." Personal responsibility and accountability begins at home, with the Parents! The onus to actually 'be' parents falls squarely upon the individuals who give birth to children. This encapsulates all aspects of parenting, which involves reading to and teaching their kids to PRIOR to entering the K12 educational system. Relying on the state to shoulder the burden of teaching the children only sets the child up for failure, in the long run. Parents, at the end of the, must parent. Now, that's just crazy talk! You should be gladly handing more of your own money so that these "experts" can continue to re-invent the education system and guarantee their own job security for decades to come. Personal responsibility and parental accountability...pshaw! I find it amazing that your answer is always the same Kevin. One solution "answer" for a complex problem, not taking into account the "systemic" problems that created this problem and goes back over 50 years. You are not interested in solving the problem, you are interested in espousing your simplistic view. I am sure you have a fine life, and you have been "personally responsible" your whole life. Bernadette, many of us have been “personally responsible” our whole lives. We got a good education and secured a job that paid the bills, waited to marry until we found a suitable mate, we waited to begin our families, we saved our money to provide a good home and life for those kiddos and then provided security and love for those dear ones. We encouraged our children to do their best in school and believed the teacher when there was a problem (very few). I am sure you have been personally responsible your whole life, but that doesn't mean others have not been. Judging the "other" for not achieving what you have achieved, when their circumstances may have been very different does not solve the problem. Michigan has some deep historical issues, and we need 21st Century Leaders who know how to collaborate, bring people together and dialogue. Unless all Michiganders are involved in solving the problems they will not be solved. While I don't disagree with your list, I would add stability and consistency at the leadership level as a necessary component to effect change. This begins in Lansing with a need to end the ever evolving requirements coming from the Legislature, also known as the "Reform Plan of the Every Other Year". Start with ending Term Limits and stop politicizing education. It seems every Legislator that went to school has a pet program to fix our educational system. Our Superintendents spend too much time battling proposals and too little time focused on improving learning. With Lansing changing categorical each and every budget, they force districts into chaotic planning. Our educational leaders know what is required to educate the students; they simply don't have the support needed to implement research based best practices. I encourage everyone to read the School Finance Research Collaborative's report. We know what to do; do we, as a state, have the courage and backbone to make it happen? Why not let educators use what they know rather than allow educational decisions to be made and continuously changed by politicians and whoever else wants a say? Repeated changes in grade level expectations and testing are not helpful. Politicians, let the educators make those decisions! Until we fix the homes Good Luck. Miracles don't happen that often. R.L. Other states have the same concerns with parents that Michigan has, and that doesn't stop them from from putting processes in place to allow (and expect) children to succeed! Let's start with recognizing that we must teach to the child, and not to the test! I could not agree more Linda. I agree with many of the comments regarding this author’s topic, particularly those submitted by John H., Paul Jordan, OIF/OEF M.B.A., and George Ehlert, particularly in regards to personal/ family responsibility and how our state elected leaders over the course of 20 years or so, have completely failed our children and grandchildren, for they are truly enemies of youth. If our neighbor had done this to his children, in some circles, that person would be labeled a child abuser, but 90% of our dimwitted legislature either gets re-elected each term or new persons get elected who offer the same failed philosophies on governing. So, apparently Michigan’s electorate isn’t very smart or moral either. One of our big problems that we are completely overlooking is that there is so much more to learn today, in preparation for a person’s educational/work life, as compared to yesteryear, because so many other skills are needed to prepare for work and adapt to changing work environments. My father had an 8th grade education, worked on the railroad for 47 years and provided very well for his family. My mother had an 11th grade education and worked for several small grocery/retail stores for nearly 40 years. Although she was not the breadwinner, she supplemented to our family’s financial well-being. I grew up in Ludington, MI and at one time there were over 500 good paying jobs being employed for the railroad/carferries. Now the railroad doesn’t even exist there anymore, neither do hundreds of other well-paying jobs that existed back then, particularly in factory/manufacturing environments, where paychecks sustained families. And these jobs aren’t coming back folks. My point is that students have to be much more prepared today and certainly more adaptable. But we are failing our kids, because we are attempting to pile all these necessary learning requirements and adaptations into the same learning time period of a K-12 education provides. And then when you add to that, all of the testing that is done on students, for several weeks nearly every year, a student actually winds up with less learning time than a normal K-12 education provides. Most of this article’s suggestions from the so-called experts to me is window-dressing, they’re suggestions are ok, but they don’t get to the heart of the matter. What we need today for our kids in addition to parent/child responsibility and electing competent persons to state government, is a pre-k through 14 grade school system, expanding the time and scope of how we teach and what students learn. Only by getting kids ready earlier and expanding their education options later, can we possibly offer any chance of student success. Once a system such as this is in place, citizens certainly will have to fund and facilitate it. So, are you up to the challenge? Only our students’ lives are at stake. Am I the only one who wonders if school of choice led to this debacle? Since this went into effect i see less parental investment in communities and education. Do any of these reports specify what actually is being taught today, i.e., how the students' time is being spent, and how the billions of dollars allocated to education in Michigan are being spent?